Physical Therapy Traveling Jobs: The Way to Go? Gone are the days when most rehabilitation was done in a hospital setting, working with patients before discharge. While there is still a huge need for hospital staff, there is another opportunity many are taking advantage of — physical therapy traveling jobs. Due to the nature of today’s economy, many hospitals, clinics, businesses, schools, and private care facilities do not have in-house rehab staff. They depend on therapists, nurses and technicians who make the rounds, visiting at scheduled times. They pay well for it, too. Other facilities need part-time replacements for staff who are on vacation, medical leave, or some other assignment. They count on hiring temporary replacements who can travel to a new location, and jump right in and contribute their skills. They value this vital assistance, and also pay well. The ideal candidate for such a job will be flexible and willing to learn new routines. They will enjoy working with patients from a variety of locations. They may want to enhance their experience to build a resume, or they may be an older candidate, near retirement, who knows they can contribute anywhere, because they’ve seen it all. For those who haven’t seen it all, the lure of experiencing new areas of the country and working in new environments is a big draw. Assignments are available in diverse settings. It is possible to do the rounds of private care in patients’ homes. It is also possible to fill a challenging niche in a prestigious hospital, working with renowned teams. New graduates can take to the road and use the experience to discover their own strengths and preferences. Seasoned veterans can concentrate on what they love most, or expand their skill set, perhaps charting a career in management. It is an ideal lifestyle for some, and more are learning about the advantages and opportunities. Benefits vary, job by job. A willingness to travel is a valuable qualification, and employers pay accordingly. If traveling is not the ideal lifestyle, it can still lead to that ideal job. Even those who do not yet know where they would most enjoy working or what specialty to emphasize in their career can benefit. What better way than experiencing a variety of locations and work conditions to learn first-hand what you love to do, and what factors you definitely don’t want to include in your working life? So, “Have Skills, Will Travel,” just may be the way to go. For a PT unsatisfied with their current placement and wanting to get out and see other places, having a number of physical therapy travel jobs to choose from can be a good thing. But what about taking it several steps beyond that point? What about a full job placement service that is your virtual representative working diligently for you on locating the perfect employment scene? If you have any inclination to achieve a better career position or geographical location, it goes without saying that there is some “distance” between you and that ideal vision you may have. Maybe you are uncomfortable with your current position but you have not taken the time to determine all the particulars of what would be ideal for you. In this case, the place to start is to envision it and write it down – in detail. Did you ever think that the first step to getting what you want is to not just say it, but fully spell it out? As a comparative, when you order a smoothie or a nice coffee, you can be very specific about what you want, from the basic brew, to the additions of flavors, shots of dairy/non-dairy and sweeteners. If you only say the word “coffee” and expect to be happy with what you are given, don’t be surprised if it is merely black – which is what some want. Possibly you did not know that there was such a service as ours, where we are focused and dedicated to not only finding your ideal employment scene, but matching you up with an employer for whom you fulfill their ideal. We want the perfect fit. We go to great lengths to achieve it. We maintain an array of job possibilities so that there are plenty to choose from. We gather data from you. We review your resume carefully and we thus get a good orientation to you professionally. We then use this in locating the job possibilities mentioned, and in many instances we are able to find potential positions which you would not find on your own. In case it is not totally clear yet, we want your job to align with your desired life and lifestyle. We are on a mission to take you as an ideal candidate for just the right position, and help you find and move into the matching, ideal employment situation. In the process of all of this, wee help you understand benefits, salary ranges, schedule flexibilities and many other important points. One final note to return to: for sure you will never get the ideal employment situation without saying what it is for you – specifically. With it laid out, and with you in touch with us, your ideal has a much greater chance of being achieved. Try it and see. If you are looking for a travel job as a PT, OT or any other rehab staff professional, fill out your profile, call us and let’s be in touch. 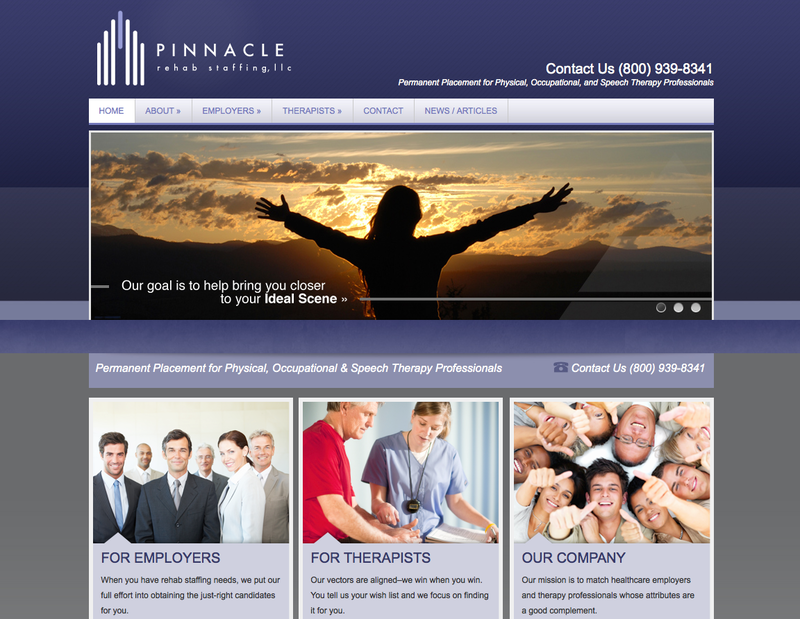 Thank you for visiting Pinnacle Rehab Staffing! We have a brand new website with a lot of great features. Medical professionals can now fill out their Ideal Scene Questionnaire online and submit their résumé and references to us instantly. Employers looking for Permanent or Temporary Staffing can send us a Request for Candidates online as well.